For Abigail Usita (College Nine ’18, human biology), learning the traditional Pilipino stick-dance called Tinikling wasn’t just about having fun. It was about a cultural journey. Created during Spanish colonial times in the Philippines, the dance involves two people clapping together a pair of bamboo poles while a dancer leaps and moves around them. The steps are meant to represent the deft movements of the tikling bird as it jumps over branches, runs through the grass, and evades capture in farmers’ bamboo traps, but it also suggests the strength and resilience of the Pilipino people who have rebelled under both conquerors and dictators. There are about 30 members on the squad. 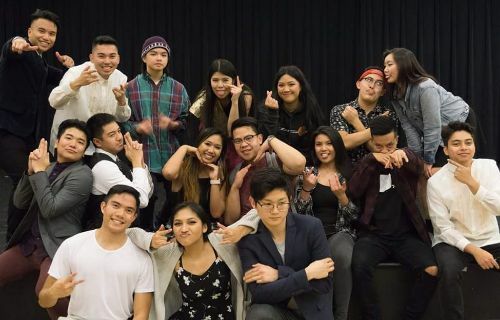 The Pagkakaisa Dance Troupe has been around campus for three decades or so and has a long list of alumni, according to Brandon Edwin De Guzman (Crown ’18, human biology), who is one of the group’s coordinators. For him and others, the dance group is not only a way to de-stress from the rigors of college but is also a way to form community and build stronger ties to their heritage. The troupe “filled a void I didn’t understand until college,” says De Guzman while sitting in the Stevenson Events Center. “I grew up in a town where our community wasn’t that big, so I didn’t have that cultural interaction with my Pilipino background except with my family. “What draws people to this (the dance troupe) is that a lot of people of color are becoming more comfortable with displaying their culture,” says Kevin Chung (College Nine ’18, intensive psychology) and another coordinator for the group. He is Korean-American but found a place in the group, which is under the umbrella of Bayanihan, previously known as the Filipino Student Association. Here, he says, he learned not only to appreciate culture but also to teach others about his heritage as a Korean as well. “For me it is about being a strong ally and appreciating the parallels and differences of culture, and learning to appreciate my own Korean heritage through this process that keeps me dedicated to this space,” Chung says. That sentiment, the need to find community on a large campus, is a big draw for its members. Indeed, the Stevenson Events Center is filled with about 100 students eating take-out, laughing, and working at their computers and rehearse. Maelia Uy-Gomez (Rachel Carson ’18, bioelectronics engineering and bioinformatics), whose roots are both in Mexico and the Philippines, says she learned a lot about her Mexican culture in school but not much about the Pilipino side of her family. “It’s nice to appreciate and embrace my heritage and learn things you were never taught in school,” says Uy-Gomez, who is another coordinator for the dance troupe. For her, dance is a physical connection to a rich heritage and history.